I really wanted this post to be uploaded for a bit now because I have used both bottles up from both brands and I have a fairly good idea of how they work. The moment that changed my mind about these Setting Sprays was when I was in Chicago and the humidity was INSANE! I sweat so easily and my face was just melting. My hair was a frizzy mess and my clothes were just sticking to me. It was not a fun experience, but my makeup held up and that is thanks to one amazing setting spray! Keep reading and I will do a full review on both setting sprays! 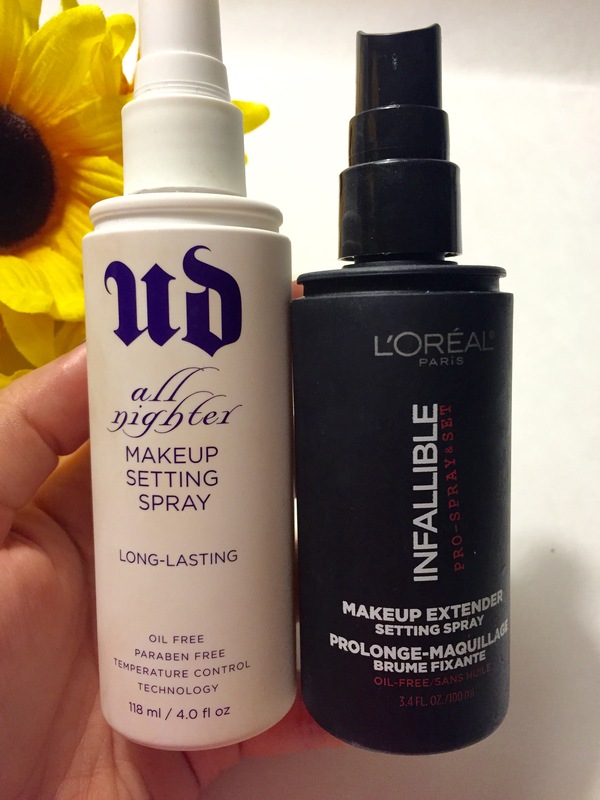 I am comparing Urban Decay’s All-Nighter Setting Spray and L’Oreal’s Infallible Setting Spray. Obviously, Urban Decay is a high-end brand that has raved about setting sprays. Before I found Urban Decay, I didn’t use a setting spray, so this was brand new territory. This brand has 2 other sprays, but I find that the All-Nighter is my go-to and my favourite out of the bunch. 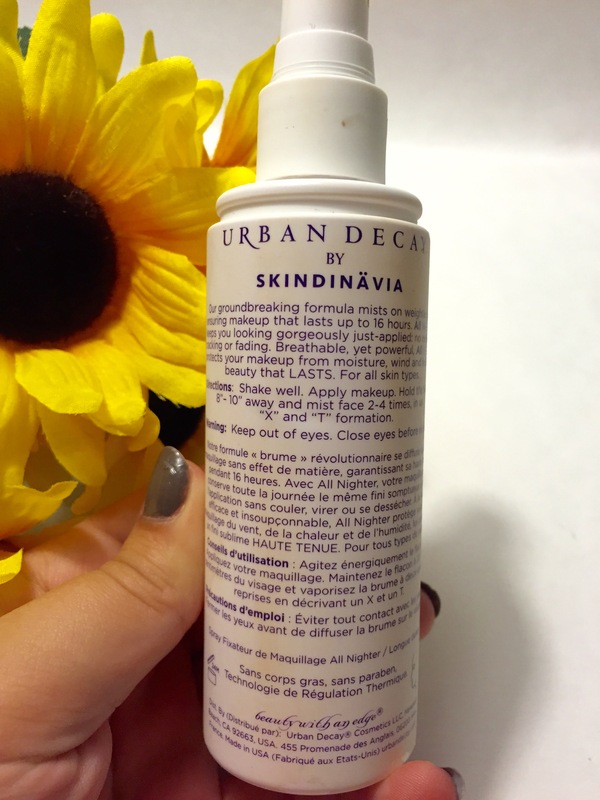 All 3 of the setting sprays from Urban Decay are made with Skindinavia, which are known for their setting sprays. They are considered to be the best of the best! With L’Oreal, this is one of the first drugstore setting sprays that I have ever tried. I haven’t really noticed too many other options, besides the ones by NYX. The setting spray from L’Oreal is a part of their Infallible line. I wanted to see if there was a cheaper alternative to the high-end brand. This setting spray is pricey, but it works. I always have a hard time spending money on makeup products, but when they work, I figured I am getting my money’s worth. This setting spray comes in at $36 CAD. I love the All-Nighter as it is meant to keep your makeup in place for a good 16 hours and no sweat, tears or water should tear your makeup apart. As I said, I have oily skin, so keeping my makeup looking flawless can be a problem on most days. The setting spray comes in a 4 oz full-size bottle or you can purchase a smaller bottle for $15 and it contains 1 oz. It comes in a white bottle with a purple cap that is in the form of a standard spray bottle. It is very easy to apply the setting spray, as I spray in an “X” formation guaranteeing it will hit all of the spots on my face. I find the spray is a bit harsher than the Infallible. It almost seems hard to get the spray out, but that is really my only complaint. It feels almost tacky once applied, but after it has dried up, my face is so smooth that it doesn’t even feel like I am wearing makeup. It seems likes it has a layer of protection over my makeup if that makes sense. This is a first for L’Oreal. It is one of the newer products from the Infallible line and I immediately thought, omg this is a cheaper version of UD’s! This product is a full-size 3.4 oz bottle that goes for $15-20 CAD, depending on where you buy it. 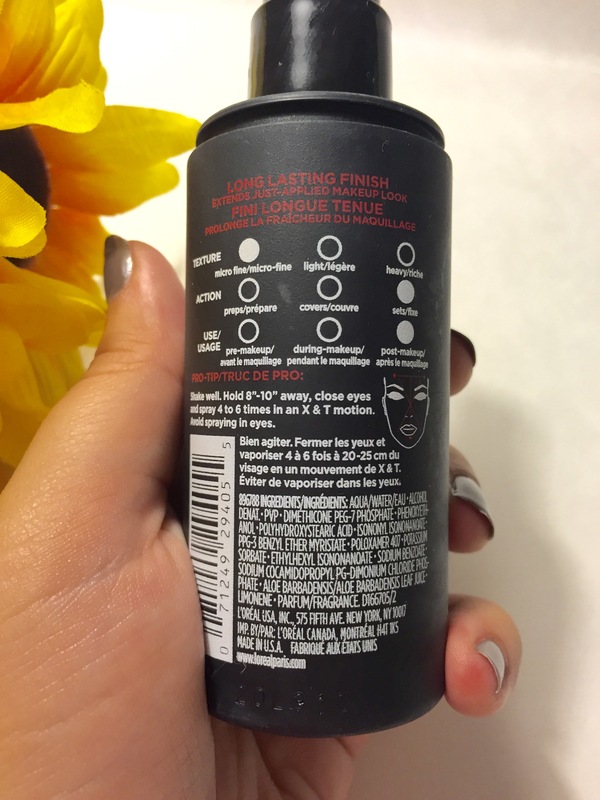 The product is a black matte bottle with the same standard spray bottle, as the All-Nighter. I really love how easy it was to apply the mist to my face. It didn’t seem as forced like the All-Nighter, but it did provide the tackiness once applied. However, once it was dried, my face was smooth just like Urban Decay’s. I really like how long the product lasted me. Both brands have great sprays that allow you to get your full money’s worth. I believe I had both sprays for a good 4-5 months. I really loved how both sprays made my makeup look after I sprayed it on. 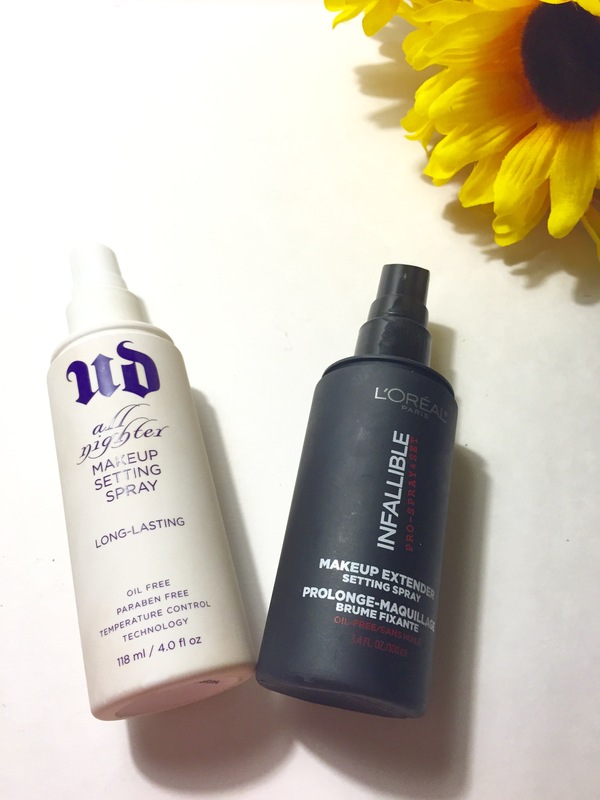 I found Infallible provided a more dewy look to my finished makeup where All-Nighter provided a matte finish and I could truly see how everything was set on my face. The main difference between these 2 sprays is the longevity. Infallible is great for wearing to work or to school.I noticed after an 8 hour day, my face would feel oily and I could see where the makeup was breaking apart. It didn’t look smooth anymore and after I had finished at the gym, my makeup was either completely faded or starting to melt off. If you need to keep your makeup in place for a short period of time and you aren’t doing anything strenuous, then use Infallible. If you are looking for a spray that lasts all day while you are working, at the gym or if you are headed out for a girl’s night, use All-Nighter. This spray was a life saver for me in Chicago! Yes, my hair was a mess, but my makeup was flawless. I had a dewy look to my face for obvious reasons, but no one of my makeup smudged or faded away. Up until that point, I was really leaning towards Infallible, but All-Nighter came out on top and showed me why it is the best! Both setting sprays are great for what you need them for. If you are looking for something cheaper, go for the Infallible, but if you want the best product out there, spend the extra $15 and purchase the All-Nighter. I hope this was helpful to anyone looking for a good setting spray! « Here’s to the Fall Season! I love UD’s setting spray. I work with glitter a lot and it desperately helps with the fallout. When I’m looking for a cheaper one, though, Maybelline’s works pretty well too. Setting spray tip: Before applying color to your eyeshadow brush, lightly spritz the brush with setting spray. It lengthens the life of the color, strengthens the pigment, and helps drastically with fallout. Have you tried the Clarins one? Amazing! Thank you! There are so many different setting sprays now that are affordable besides Urban Decay. L’Oreal is great, but I am also loving NYX’s setting spray. It’s super affordable as well! Great review! I also use the UD and have almost purchased the L’oreal on whim. Good to hear your feedback. Thank you for reading 🙂 L’Oreal is great if you want a cheaper option but UD will always be the best. So interesting how different people prefer different things. I found UD did nothing for me and the L’Oreal is a bit drying. Someone recommended the Skindanavia one for me so I’ll look into that. Love it! I have nominated you for the beauty blogger award, check out my blog for the details. Agreed. I have the skindinavia one which is basically the same thing! I don’t use it for my face anymore but I do use it as a kind of fix plus for my eyeshadows. That’s a great idea! I can only imagine how well it works for your shadows. Great post, it’s help me decide that I definite need the UD all-nighter now! For the price of the UD all nighter you may just want to go with MAC’s prep + prime. It has wonderful ingedients an leaves your face feeling so fresh and rejuvinated. It also has actual caffiene in it, which has numerous benefits for your skin. Like treating redness & inflamation, reducing the appearance of under eye circles and cellulite. Overall caffiene helps you ahieve a smooth even look to your skin anywhere on your body, not just your face! 🙂 UD may have serious “lasting power” going for them, but so does MAC’s and their ingredients are great for your skin. Ooh thanks, that sounds great! Although it doesn’t actually help me decide.. Lol. Guess I’ll need to check them out as well now. 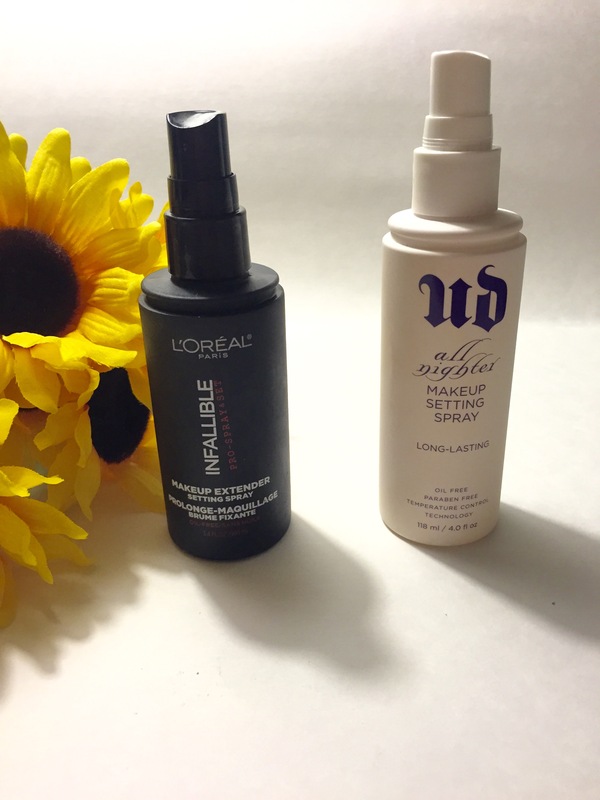 ahh I definitely need to try the infallible setting spray now! Thank you for your review!